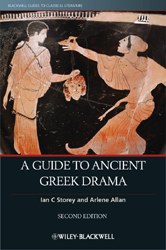 Revised and updated, this second edition of Wileys guide to ancient Greek drama offers a concise and accessible introduction. The text offers insights into ancient Greek dramas political and cultural context and examines its core themes. In addition to critical essays on playwrights, the contents include material on the origins and conventions of drama, the theater, the performers, and the relationship between drama and the worship of Dionysos, the Greek god of ritual, wine, and festivity.